Sunday morning (maybe to work off the calories from Friday and Saturday’s dinners) I set out on a solo bicycle ride. I often ride on Sunday mornings with Markus, but he was out of town. Plus, urban riding doesn’t lend itself to groups. You can’t ride side-by-side and chat along the way, because the streets just aren’t wide enough. There is some concern about the safety of riding in the city. For the most part, I think the concerns are over-stated. Drivers in Khrungthep pay attention and are used to sharing the road with motorcycles, tuk tuks, vendors with their food carts, and other non-automotive traffic. The streets in some parts of Khrungthep are narrow, traffic is heavy, and road conditions can vary widely from freshly paved to potholed. The worst part, though, are the buses: they are large, their drivers are maniacs, and most of them run on very unclean diesel fuel, leaving behind a choking cloud of black particles. Still, riding your bicycle is one of the best ways to get to see the city, giving you the flexibility to easily stop and explore, while letting you move quickly enough that you don’t wear out just within a few blocks. You can also recover from dead-ends much more easily when riding than you can when walking. Sunday’s ride ended up taking about two-and-a-half hours to cover 42 km. 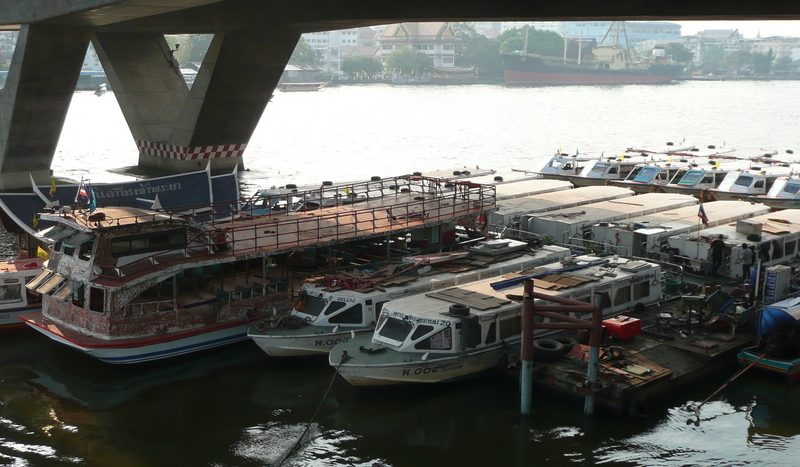 Starting at home on Sukhumvit Soi 53, I wound my way through the back sois until I reached Khlong San Saeb, the canal that cuts east-west through the city and provides water taxi service into the heart of the old city. There is a pedestrian path alongside the canal that I’ve ridden before, so I followed it a short way to the west before crossing over a foot bridge to the other side and entering the back of a temple. The front side of the temple leads to Phetchaburi Road, one of the busiest traffic routes heading into the old city and one that has more bus traffic than you can believe. It is also one of the most direct routes into the city, so I followed it all the way to Sanam Luang, the large parade grounds immediately to the north of the Grand Palace. Large crowds of black and white-clad Thais were arriving at the Grand Palace to pay their respects to Her Royal Highness Princess Galyani Vadhana, the King’s older sister, who passed away on January 2nd. We are in a period of mourning for her and later this year there will be a royal funeral and cremation on Sanam Luang. It should prove interesting as it will be the largest such event since the royal cremation of HRH the Princess Mother in March 1996. One thing I discovered is that there are a lot of homeless people sleeping in the cool spaces beneath the bridges and near the water. Several were also using the steps leading into the river underneath the bridge for their early morning bathing, modestly wearing swimming shorts or boxers. The city sparkles at this early hour with a good number of locals up and around but very few tourists. The tourist boats ran up and down the river almost devoid of passengers, while the small ferries were filling quickly with locals coming and going from home to market, temple to restaurant. Now on the western, Thonburi side of the river, I pedaled south into the bright morning sun through a predominately Chinese neighborhood that had bright red banners strung across the street in anticipation of next week’s new lunar year. My route took me down Charoen Nakhon Road, past the Peninsula and the Hilton Millennium hotels before I arrived at the Taksin Bridge (“B” on the map). 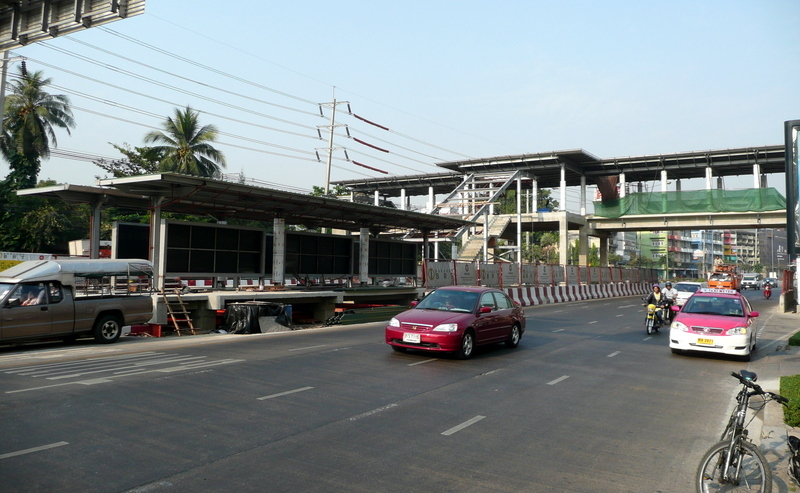 This is the bridge over which Sathorn Road runs, as does the Skytrain extension that will some day (this year, maybe?) connect to five stations on the Thonburi side of the river. 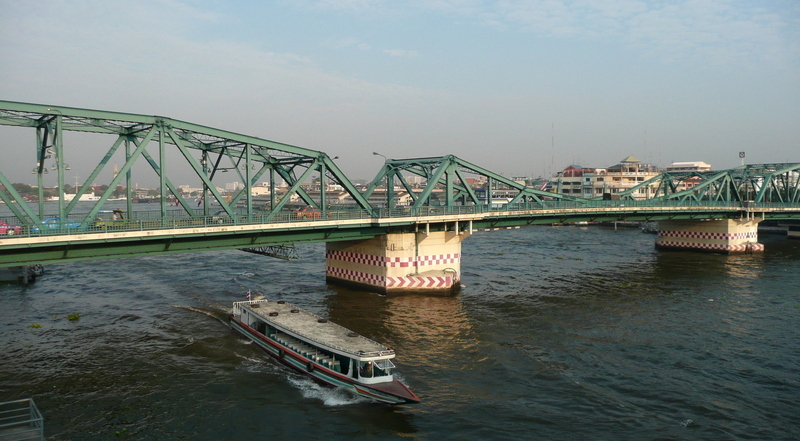 It should be pointed out – to clarify the confusion that some farang experience – that the name of this bridge (Taksin) should not be confused with the name of the deposed Prime Minister, Thaksin Shinawatra. The names are not the same in Thai (ตากสิน vs ทักษิณ) and are pronounced a bit differently with the bridge starting with a hard “d/t” consonant rather than the softer, aspirated “th” sound as in the word “tall”. 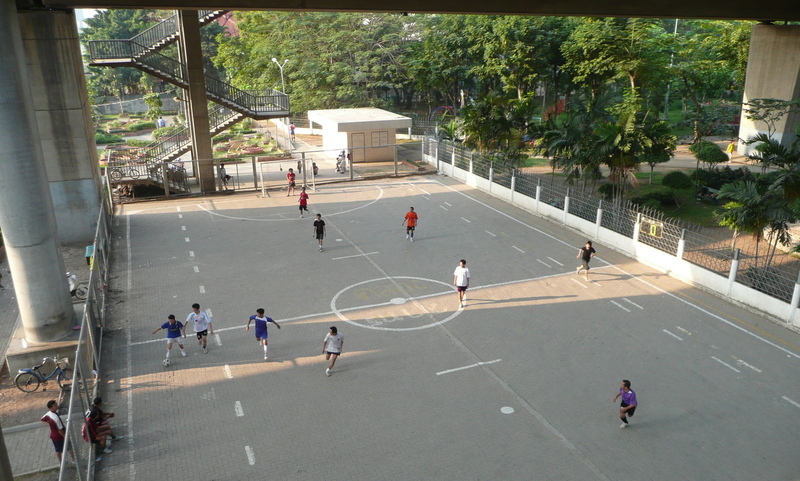 Beneath the bridge is a park with a football pitch and several takraw courts, in addition to other health and fitness facilities. There were perhaps a hundred or more Bangkokites getting their morning exercise. Takraw is a popular Southeast Asian sport characterized as “kick volleyball”. Using only your feet, legs and head, teams propel a rattan ball over a low net on a badminton sized court, following rules that are roughly similar to volleyball. Watching the players, it looks like a sport that takes tremendous flexibility and concentration. Also beneath the bridge there are a large number of passenger express boats and a ferry, mostly older, sitting and waiting for repair, heavy crowds, or their eventual scrapping. I continued across the Taksin Bridge, stopping in the middle to capture this picture looking up-river, below. From left to right, you see the Peninsula Hotel, the Hilton Millennium Hotel (with the spaceship lounge on top), the CAT Telecom building (with the antennae), the lower-rise Mandarin Oriental Hotel, and the Shangri-La Hotel. 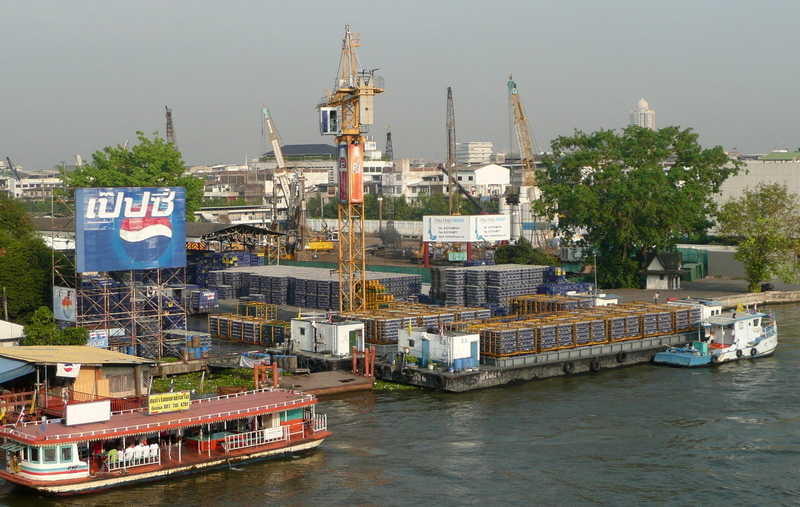 Also near the Taksin Bridge, just to the left of the picture above, is the Pepsi bottle reclamation facility. This is the point to which all of the used Pepsi bottles from throughout the greater Khrungthep area are brought. They are then loaded on barges – several a day, from what I’ve observed – and then towed up river to the Pepsi bottling plant north of the city. Behind the Pepsi pier is the construction site for The River – what will be a 73-story condominium building, a monstrosity that will be entirely out of proportion for the waterfront. The illustration to the right is from The River’s own press department. While the foreshortened perspective exaggerates the different heights, it still shows how grotesquely out of balance this building will be. 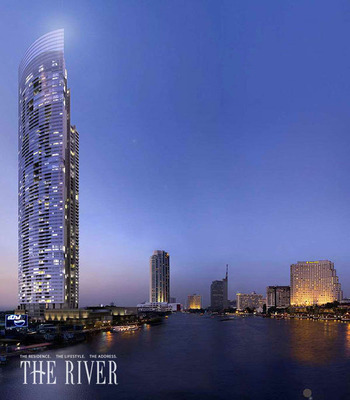 As the second highest tower in Khrungthep (Baiyoke Tower II is 85 stories and the nearby State Tower with its rooftop restaurant is 63 stories), it will be very hard to miss on the skyline. 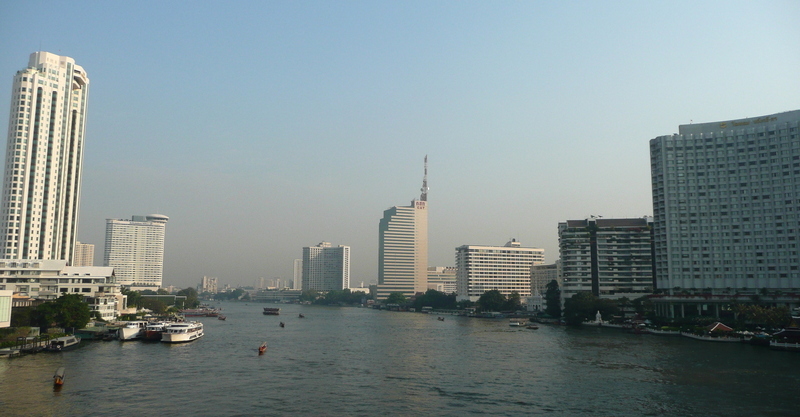 Subsequent to its approval, the Bangkok Metropolitan Authority enacted new legislation, restricting any future development along this section of the river to only eight stories. One can only hope that development remains controlled so the waterfront does not end up like Hong Kong’s. The geography of Hong Kong makes that sort of vertical development work okay, but here in the Big Mango, we would end up with a wall of buildings along the river, keeping river breezes from cooling the rest of the city and essentially making river views the domain of only those with the most money. 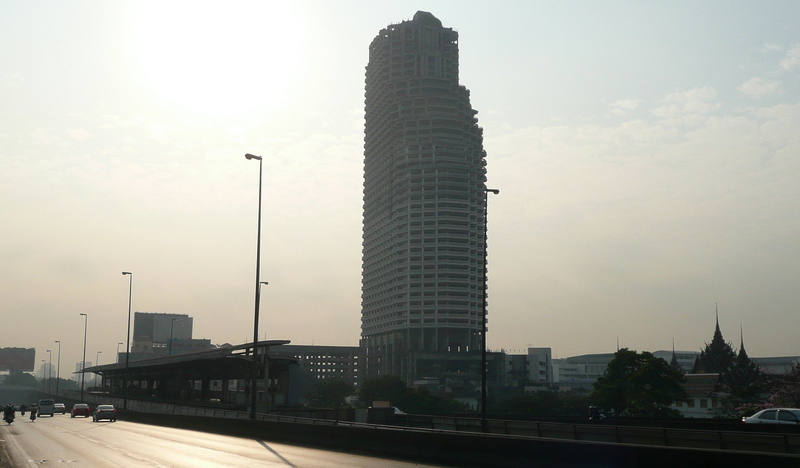 Looking west along the bridge, into the morning sun, I could see the last Skytrain station on the line (until that extension opens) – Taksin Station, below. Behind it looms an unfinished tower that was the sister of the State Tower (mentioned above). There are some interesting pictures taken from the State Tower during its construction, when it was known as the Royal Charoen Khrung Tower. 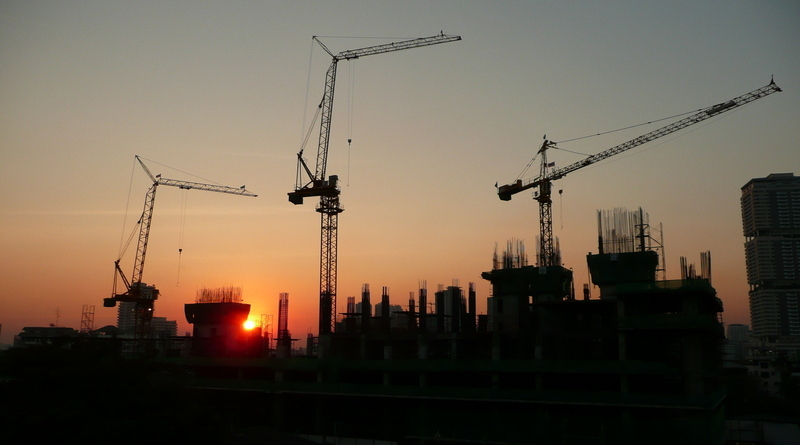 Interesting that with so many unfinished buildings in this city – estimated at over 300 – that there is enough demand for so many other new high rise projects to be commenced. Crossing the rest of the bridge, I walked down four flights of stairs to the street level, and resumed riding on Charoen Khrung (literally, “New Road” – the first paved road in the city). This is where the city gets especially interesting because it is really the heart and soul of the city. Outside of the royal portion of the city – Rattanakosin Island – this is the street on which the early Bangkok residents were going about their lives. I continued all the way down Charoen Khrung until it dead-ended near soi 109, right next to the Good View Restaurant, situated at a sharp turn in the Chao Phraya River. Pedaling into their empty parking lot and right up to the water’s edge, it did indeed have a good view. Backtracking along Charoen Khrung and just a little confused as to where I was – I had no map with me and was working only from a mental picture I had in my mind, one dotted with unfilled areas reminiscent of the “there be monsters” notations on ancient mariners’ maps. Shortly, I connected with Rama III Road, a major thoroughfare that feeds off the New Khrungthep Bridge. A large road, it was thankfully not too busy this early on a Sunday and it had very wide lanes, giving me plenty of room to ride unmolested by passing motorists. 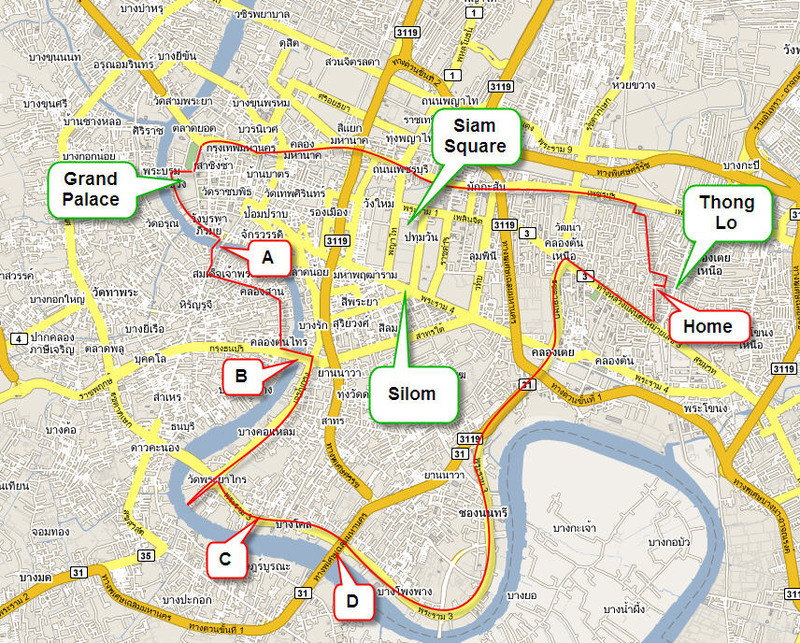 Rama III is also the planned route for Governor Apirak’s ambitious Bus Rapid Transit program. The official website is here – it is in Thai but the pictures will give you an idea of what’s happening. Scheduled to open in about a year, there is already signs of progress. There are several BRT stations under construction – this one is located in front of a shopping center (“C” on the map) on Rama III Road. My understanding is that the busses will have exclusive right-of-way in the center lane for most stretches of the road, giving it almost the same effectiveness of a light rail system but with significantly lower capital costs. Special buses will have to be purchased that have doors on the right-hand side instead of the left. It also looks like the platform will be very high, so presumably the doors will also be raised. In either case, kudos to the local government for making an effort on transit issues. That, combined with the planned conversion of all 2,000+ plus local busses from diesel to compressed natural gas in the next two years, will hopefully help reduce pollution at least a bit. 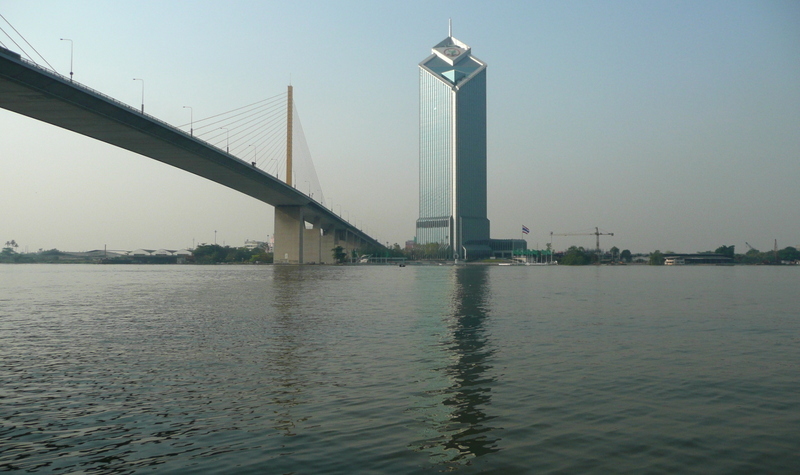 Continuing along Rama III, I soon arrived at the Rama IX Bridge (“D” on the map) which carries the Rama II Expressway southwest towards Samut Sakhon and Samut Songkram provinces. If you’re a little confused by all the “Rama” names, that’s understandable. It would certainly be easier if the Rama II Expressway crossed the river on the Rama II Bridge. Looking just downriver from the park, you can see the “Mega Bridge” complex, a series of two recently opened bridges that cut across the Phra Pradaeng peninsula, significantly improving access to the south, southwest and southeast of the city. 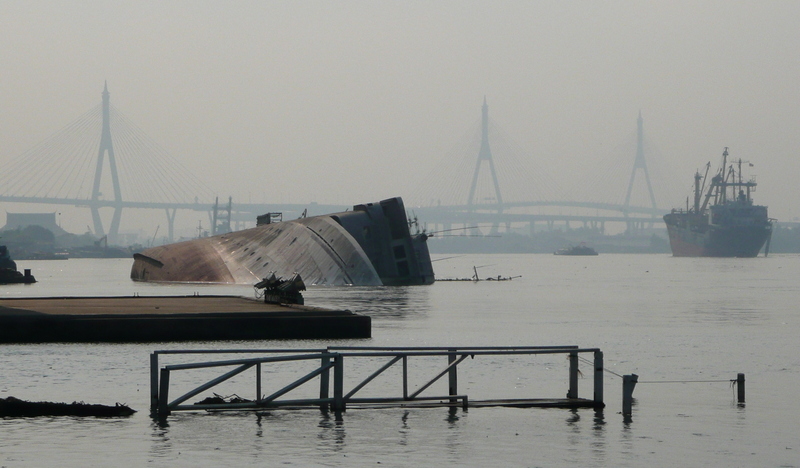 You can also see a capsized ship, below. I remember reading about this sometime last year on 2bangkok.com but was unable to locate the information. It makes for an interesting image, I think. My ride continued along Rama III Road and back through the Khlong Toei port area. While there were probably still plenty of interesting things to see along the way, I was getting tired and traffic was picking up, so I did less sightseeing and more watching for crazy bus drivers. The last leg of my trip brought me back into familiar territory, past the Queen Sirikit Convention Center – where Markus and I regularly ride circles in the adjacent park – and then town Sukhumvit Road to home, where I arrived just after 10:00. It was a lengthy ride, but afterwards I feel like I have a much better understanding of many parts of the city I had not explored before. Still, there’s plenty of ground to cover! Fine dining, western-style, is still in its infancy here in Khrungthep. We have fine dining, alright: som tam, khao chae, tom yum goong, and a host of curries that work miracles on your taste buds. But western style dining faces a number of traps – ranging from fickle and inexperienced diners who are wary of venturing into unfamiliar culinary ground, to astronomical food costs for fundamental western ingredients that are not available locally, to a service mentality that runs counter to delivering each diner’s dishes at the same time – that can befuddle would-be restauranteurs. It is against this backdrop that new restaurants open and, sometimes, succeed. Paradox, owner Adam Bryan-Brown’s new high concept dining, shopping, and art exhibition space, has opened its doors (partially) to see how it will be received by, and how it can shape, Khrungthep’s high-end diners. 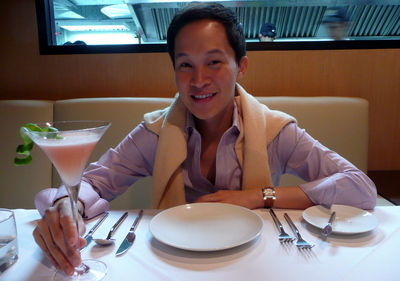 Right: Tawn enjoys a promotional Belvedere vodka cosmopolitan with a lengthy twist. In the interest of full disclosure, the meals I had at Paradox on Friday and Saturday were part of a promotion where the four-course set menu (priced at 1250 baht) was offered free to the first twenty reservations each day. Additional items and gratuities were paid for ourselves. In talking about the food and restaurant, I’m approaching it from a “What if we had paid for the entire meal ourselves?” perspective. The front half of Paradox’s multi-space building remains under construction, above. This space, which is scheduled to be a retail store and possibly a wine and jazz bar in the evenings, will do a lot to determine how visible and welcoming Paradox is to passers by on Soi Ekkamai. In a neighborhood filled with nightclubs and restaurants, having a good face will be important. 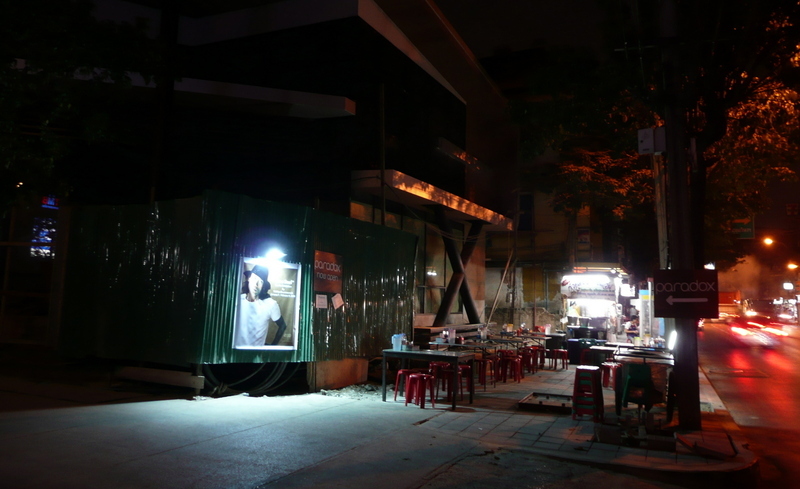 As construction continues, Paradox is barely visible, hidden down a driveway near the corner of Soi Ekkamai 17 and fronted by a sidewalk noodle vendor. It is worth a walk down that driveway, though, as the interior is modern and comfortable. A future open-air terrace dining area, a second floor private dining room and a quieter dining area behind the kitchen make the restaurant seem smaller than it really is. There is a large gallery/multi-use space that would lend itself well to many sorts of arts events. Currently, there is an exhibition of vibrant oil paintings by Vichian Boonmeemak in this space, which calls diners to leave their tables and browse the artwork between courses. Chef Andrew Cole is at the helm of a large and capable kitchen team, turning out food that Tawn interestingly described as “comfort food”. Interesting, because while I wouldn’t use that word myself (I picture macaroni and cheese when I hear the words “comfort food”), I understand what he’s getting at. 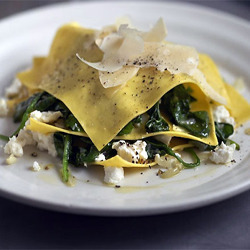 Cole’s Mediterranean inspired cuisine avoids pretentiousness by preparing fairly conventional ingredients – roast chicken, for example, or spaghetti with scallops – in creative yet grounded ways. There is no over-reaching with foo-foo additions like a dollop of medjool date paste, a pillow of lima bean foam, or cubes of bay leaf gelatine. That’s important because all too often in fine dining, there seems to be the urge to turn fusion into confusion: searches for inspired and new flavor combinations turn out messy and misguided. Let’s take a look at our dinner, which was the same both nights with the exception of the amuse bouche and a pasta dish on Saturday. 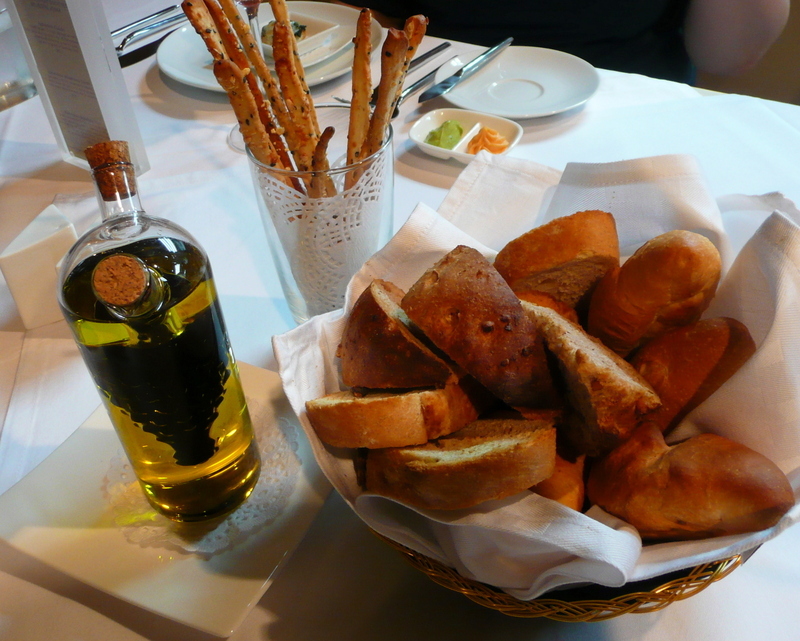 One thing that sets Paradox apart right away is their bread basket, above. Khrungthep is a city lacking in quality bread and the Paradox bread basket was a welcome start to the meal. The bread sticks are light and flaky things of beauty and the spinach bread we had on Friday (I think it was a spinach bread… maybe basil bread?) went very well with a tomato spread that accompanied it. 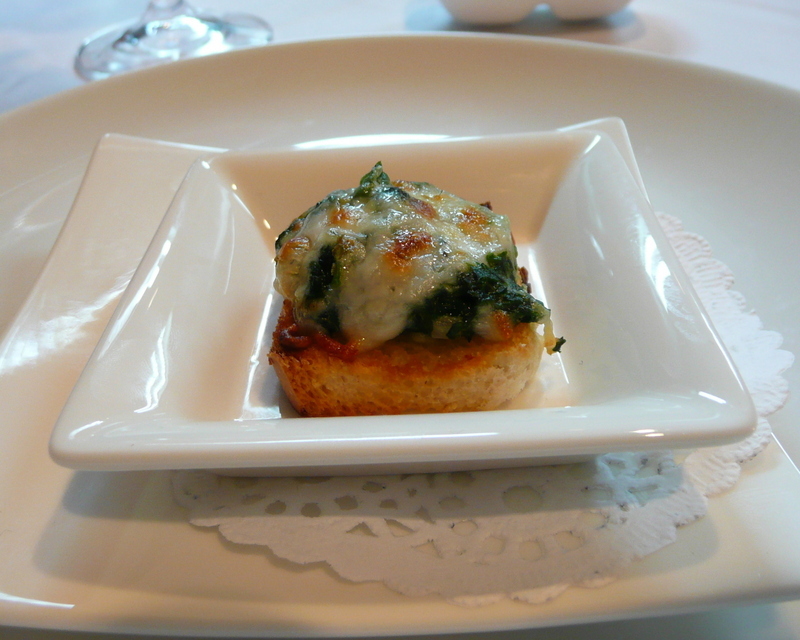 An amuse bouche of spinach au gratin atop toast was very tasty, below. A plate of a dozen of those along with the soup would have been enough to make a satisfying meal. Friday’s amuse bouche was a deep-fried half of a baby zucchini served with an olive tapenade and red sauce. Both were welcoming and familiar ways for the kitchen to greet the diners. The set menu began with a Parma ham salad, above. What on the menu could be mistaken for a stodgy and unimaginative start was creatively – and tastily – inverted. 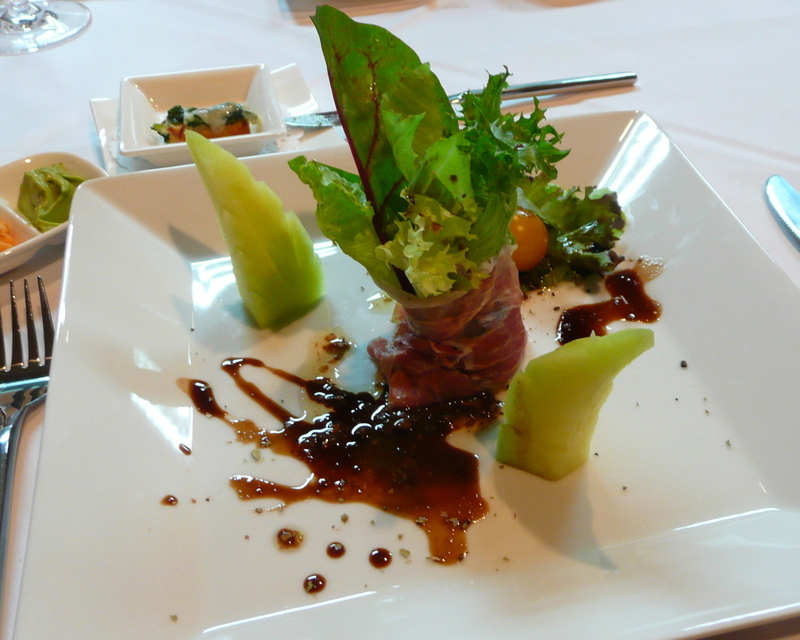 Whereas you would normally expect melon-wrapped ham with a side of greens, the chef instead wrapped the beautiful greens with the ham and balanced the melon on the side. A couple of perfectly ripened tomatoes and the accompanying balsamic vinegar reduction nicely tied together the flavors while the plate’s arrangement was pleasantly architectural without being silly. 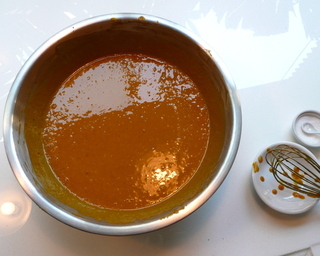 One hit of the menu was the cream of pumpkin soup, below. 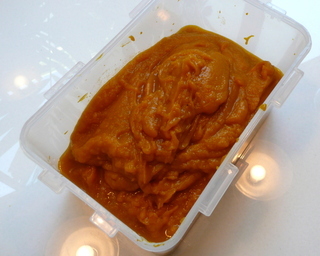 Pumpkin has such a wholesome, good-for-you flavor and when it is balanced with just the right amount of cream, it is such a delight to eat that I could subsist on this and nothing more – except for those spinach au gratin amuse bouches, which would go wonderfully with the soup. 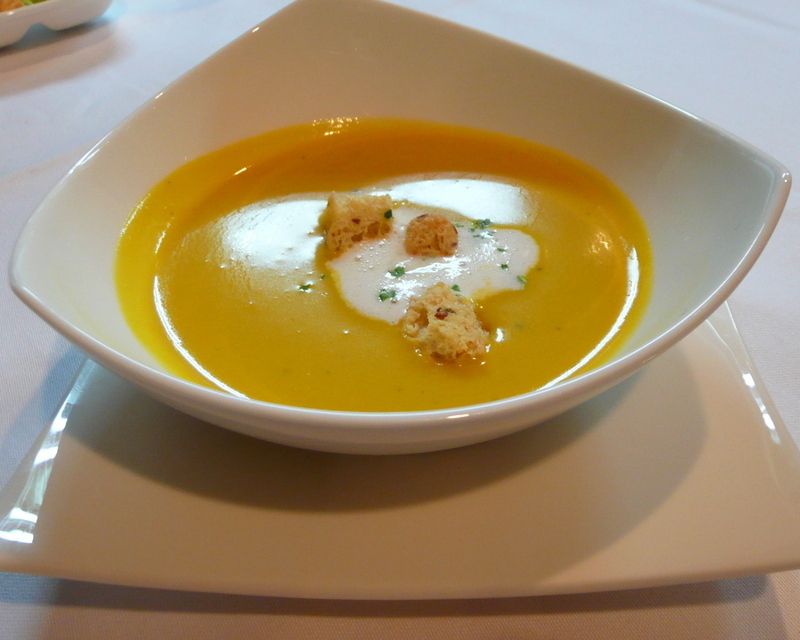 The texture of the soup was velvety and the garlic croutons lent a nice textural contrast with their crunchy-then-buttery-soft quality. There were three main courses from which to choose and since both nights we had three diners, we chose all three and shared. 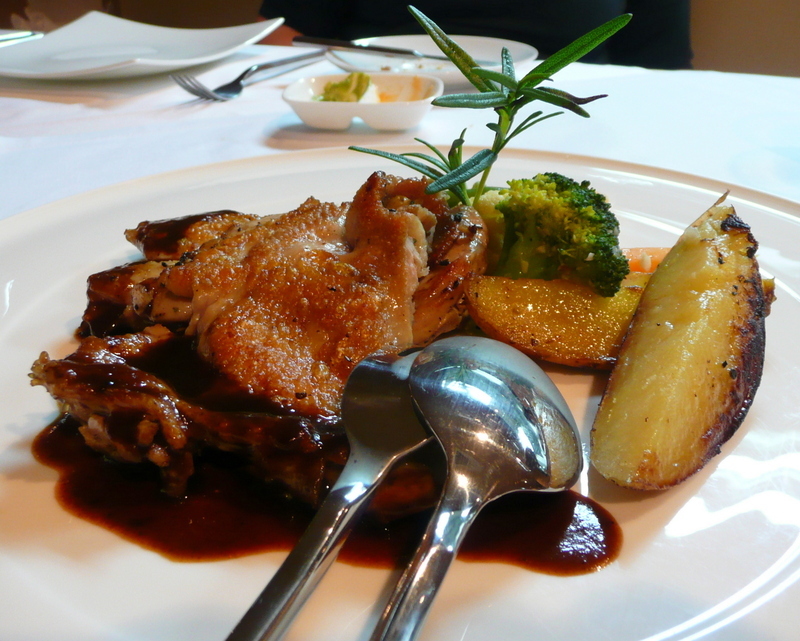 The first was a roasted boned baby chicken with port wine sauce, above. This was a very nice take on a menu standard – roast chicken – and was successful because the chicken itself had such nice flavor. Beyond the sauce, beyond the crisp skin, this was one tasty chicken. The port sauce was a nice addition and the accompanying medley of vegetables were well-prepared. The chicken suffered from some toughness on Saturday night, but was none the less flavorful. 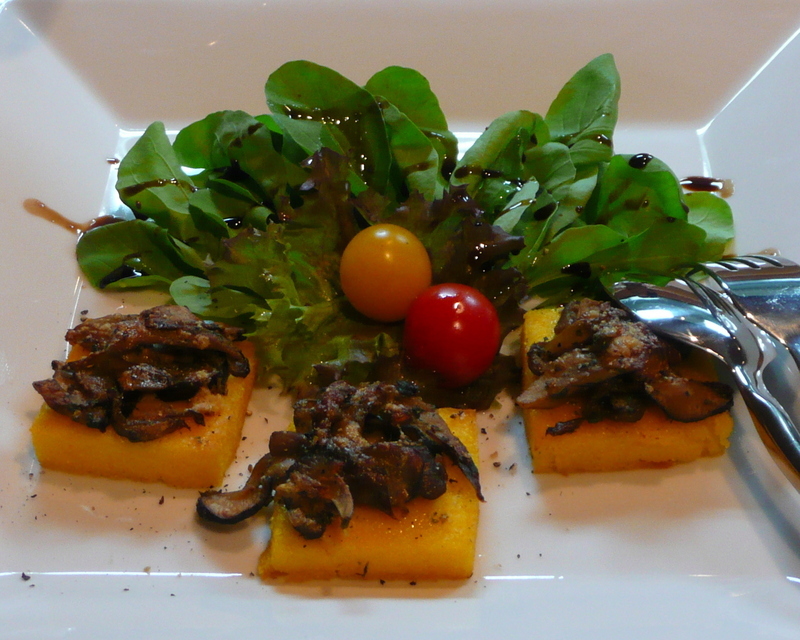 A vegetarian option, gilled polenta with sauteed mushrooms served with rocket salad, below, again took a classic combination and brought out the best of the flavors and textures through skillful preparation. The dish was piping hot and the polenta perfectly crisp on the outside and creamy on the inside Saturday evening, making it even more satisfying, although it would benefit from just a few drops of balsamic vinegar to complement the earthiness of the mushrooms. 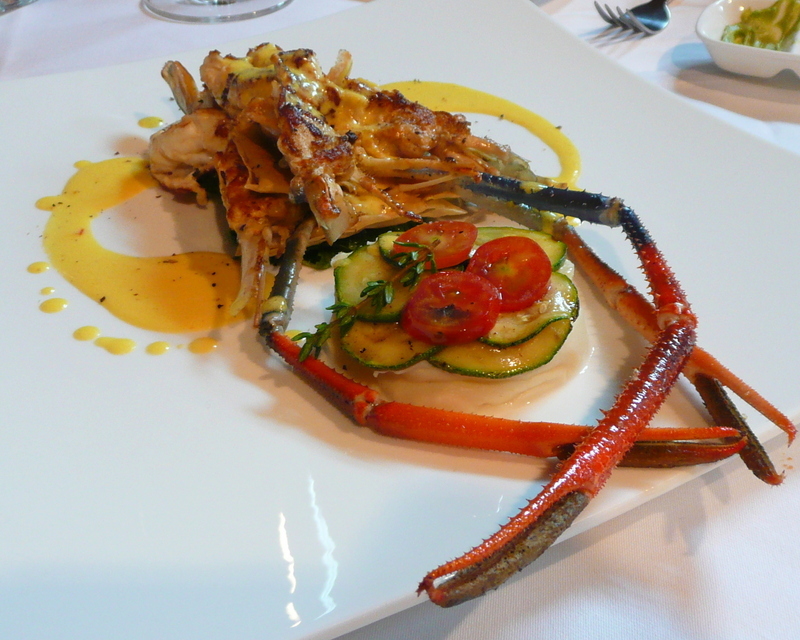 The third main dish was a millefuille of river prawn served with saffron creme sauce, above. This was the most “artsy” of the dishes but was actually much simpler than it may sound. Resting on a bed of spinach – Tawn thought zucchini would have been a better choice, but I really liked the flavor of the spinach – the prawn was sliced and separated by a layer of puff pastry. 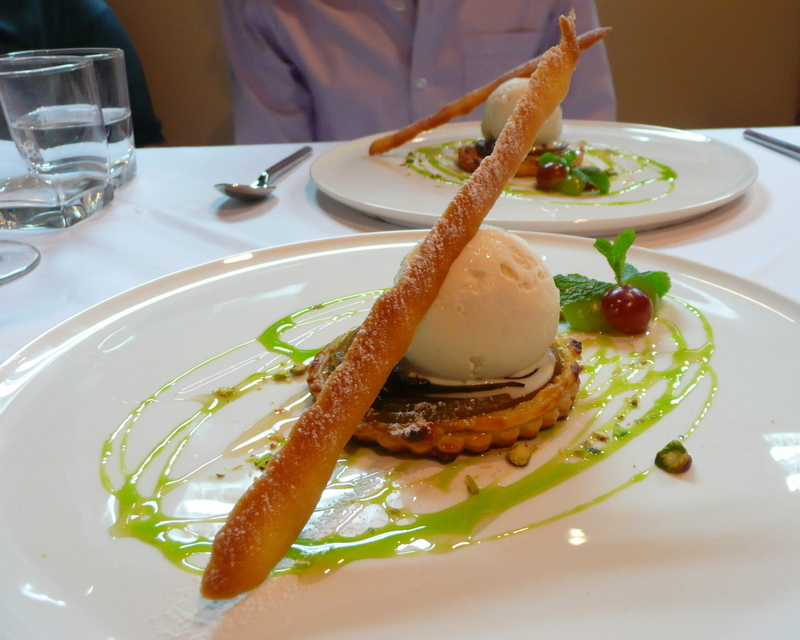 The textural component of the pastry was an interesting touch; my dilly-dallying on Saturday, trying all the other mains before concluding with the prawn, did the texture no favors but the fault was entirely my own. The saffron creme sauce lends a nice richness and a subtle hint of floral spiciness to the fresh, clean flavor of the prawn meat. 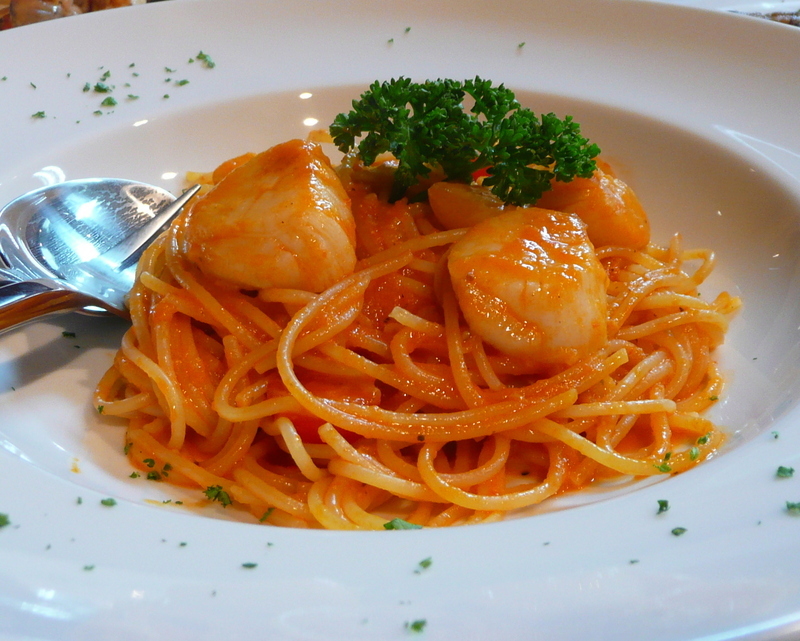 On Saturday we ventured briefly onto the a la carte menu to try the spaghetti with scallops (imported from the US, which seems unnecessarily far) in a tomato and capsicum sauce, below. Tawn found this to be reminiscent of the satisfying foods of his childhood, the sweetness of the peppers in the sauce playing nicely with the sweetness of the scallops. Dinner concluded with a very nice apple pie with vanilla ice cream, above. This has to be the most classic of “comfort” desserts (except for the tasty but overly frequent creme brulee that seems to be on the menu of every restaurant in creation) and it was so nicely done. Constructed as a tart, the pastry crust was flaky and tender, the apples cooked to just the right point of softness, and the accompanying honey-based sauce (colored by pandan leaf, is it?) was a beautiful addition, albeit a little too sweet on an already sweet dish. This proved to be a very satisfying finish to the dinner. Throughout dinner both days, we received extremely polished and attentive service. Right now the dining room is not filled to capacity and hopefully the staff retains their polish in the heat of a busy night. But at this point the very good food is accompanied by the sort of service organization lacking in many of the fine dining restaurants in the Big Mango. In speaking more with the chef, he sounds very interested in exploring the use of local ingredients as well as doing special menus featuring the cuisines of different regions around the Mediterranean. The second idea is one done well at several restaurants, and the upcoming focus weeks – “Vegetarian Delights” the week of February 18th and “The Food of Spain” the week of February 25th – will give Cole some room to play. It is the first idea, though – the one about exploring more local ingredients – that may prove to be the biggest test of his skills and, perhaps, Khrungthep fine diners’ often limited adventurousness. With the host of great ingredients available on the land and in the seas around Thailand and Southeast Asia, it is a shame that more local diners are so insistent that their tomatoes are imported from France, their cheese from Italy, and their sea bass from Chile. I’m very excited about the idea of more dabbling with locally-sourced ingredients as I tire of paying high prices just to subsidize the long air and sea journeys of my ingredients. As for Friday and Saturday nights’ dinners, Paradox looks to have the sort of foundations that make for a truly successful restaurant: good space, good location, and – most importantly – good food and service. The chef’s kitchen is turning out thoughtful and well-prepared versions of standard dishes – a good way to get started. He shows enough creativity and imagination to play with some of the assumptions diners might make and, in so doing, may have the opportunity to explore some really interesting culinary ground. There are still many questions to be answered about how the menu develops, how the space is used once construction is finished, and whether the quality can be consistently maintained over time. But from these first few visits, I have no doubt that Tawn and I will make Paradox a destination when we want to celebrate birthdays, promotions, and other special occasions. Friday night, Roka, Bill and I had dinner at the soft opening of a new restaurant, art gallery, and performance space called “Paradox” on Soi Ekkamai. Website here. It is a fancy new high-concept place featuring Mediterranean food. Since they are not quite finished with construction of the whole complex, they’re doing this soft opening to ease their staff into operations and to get the word out. They offered a not-much-advertised promotion featuring free four course set dinners for four, for the first twenty reservations each day. The promotion ends today. Roka read about it in a blog and called me, so we made reservations for Friday evening. It was really good, but I didn’t bring my camera. Course after course, I cursed my camaralessness. After dinner the Australian chef, Andrew Cole, came by the table and we talked for about twenty minutes. We critiqued the food (mostly compliments with only a few bits of feedback), learned how he found his way here (because of Pakistan’s political troubles he discontinued a cross-continent journey and ended up here), talked about the challenges of fine dining in Bangkok (expectations of the well-heeled locals are largely based on what everyone else is doing, not on what is new, original, or even good), and his vision for the restaurant. The picture here is from their website, but it shows the general idea behind the food. As there were only three or four tables being served while we were there, we inquired as to whether they had any places left on Saturday night. Why not come back and enjoy another free meal and get some pictures for the blog? Sadly, they were at 22 reservations so they were past the free dinner stage. We decided we’d wait until another day, but then at the BTS station, Roka received a phone call. It was the manager. Andrew had spoken with him and would we care to come back for another meal on the house? Every culture has its odd dichotomies. For example, Thai culture – being hierarchical – is sometimes very rigid. “Cannot do,” you’ll be told when making a request that seems to be a small deviation from the norm. The boss says it is to be done this way, so that’s the only way to do it. No amount of rationalizing or logic will make the deviation happen. Other times, thanks to the laid-back nature of Thai culture, it seems there isn’t a rule made that wasn’t designed to be broken. This cuts both ways, of course, but is often to one’s own advantage. Such as this afternoon when we paid the contractors who work for Siemens (the manufacturer of our clothes washer and dryer) a little extra on the side to drill a hole through a wall in the space above the drop ceiling, so that the dryer can vent into a pipe chase. Previously, it was just venting into the space above the drop ceiling. Not only did that make the bathroom very humid when trying to dry clothes, but it could also result in a bit of a fire hazard as lint builds up over time around the bases of the ceiling light fixtures. It is that “okay, can do” flexibility that is a particularly enjoyable part of Thai culture. Of course, dichotomies are the very nature of a culture. The culture isn’t defined by one extreme or the other, but rather it is defined by the interesting space that lies between; the internal dialogue that the members of that culture engage in to guide their daily interactions and activities. Update on the pumpkin pie and whipping cream situation. Based on all that feedback (thank you) I think the cream was not cold enough. Markus brought it from the store so by the time I whipped it, it would have spend a good twenty to thirty minutes in the tropical weather. 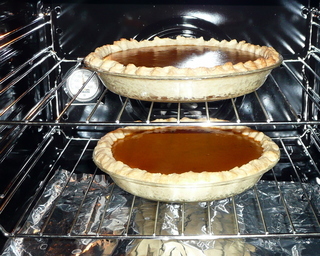 The rest of the weekend baking project – kind of my own personal Iron Chef challenge – was around pumpkin. Pumpkin is an interesting ingredient for me because as a child, I disliked both pumpkin and squash, to the extent that the flavor would literally make me gag. I’m not sure why. Maybe the flavor is kind of strong? The one squash dish I did like was the squash rolls – a dinner roll made with some squash puree – so maybe that validates my theory, since the rolls didn’t have a very strong squash flavor. I also didn’t like sweet potatoes, yams, and tofu as a child – all things that I just love now. Another theory why I didn’t like them then was that I didn’t like them until I had them particularly well prepared. My mother went through a big tofu phase sometime in the late 70s. We lived in Northern California, meat was expensive, and tofu was all the rage as a healthy, inexpensive meat substitute. My mother got hold of two cookbooks by Gary Landgrebe – Tofu Goes West and Tofu at Center Stage. On the cover of the first cookbook was an illustration of a covered wagon being driven by a block of tofu. On the second was a picture of a stage with a block of tofu tap dancing in the center of it. No kidding. I was able to find the books online still, but no cover pictures. Anyhow, Landgrebe’s take on tofu was basically to substitute it anywhere a recipe might call for ground beef. It wasn’t until junior high school, when I started hanging around with several first generation Chinese-American friends, that I finally learned to appreciate tofu. 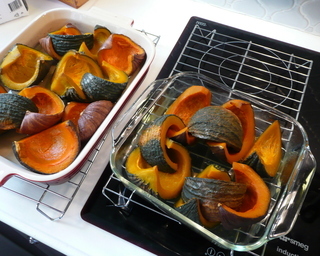 The same probably goes for squash and pumpkin. More exposure to the vegetables prepared in a greater variety of ways, has led me to really enjoy them even more. Roasted root vegetables, with squash and sweet potatoes, for example. 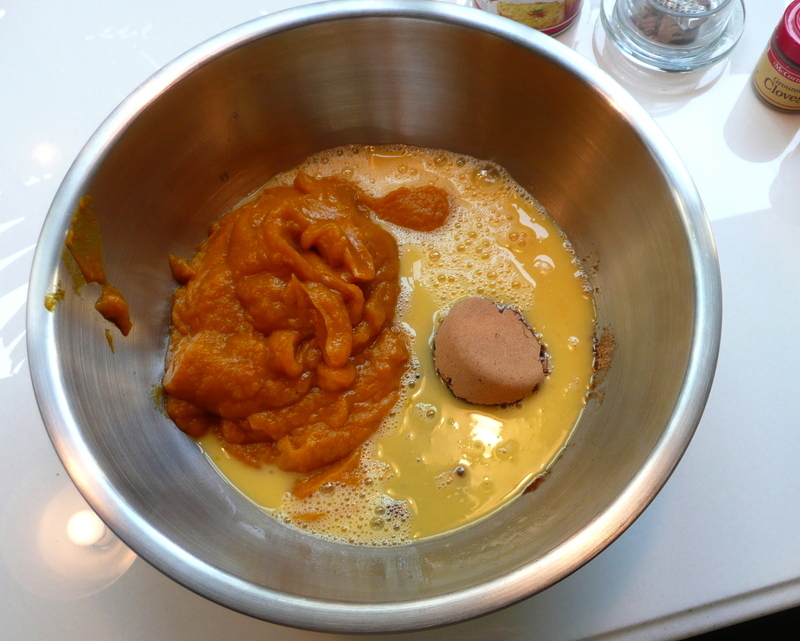 Mixed with some olive oil and rosemary… mmm, yummy! 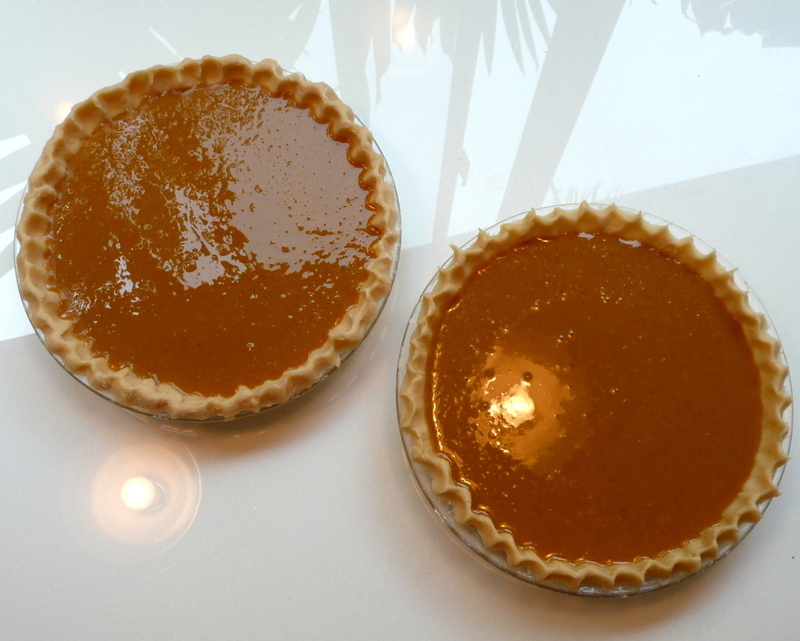 So it was with pumpkin pie. 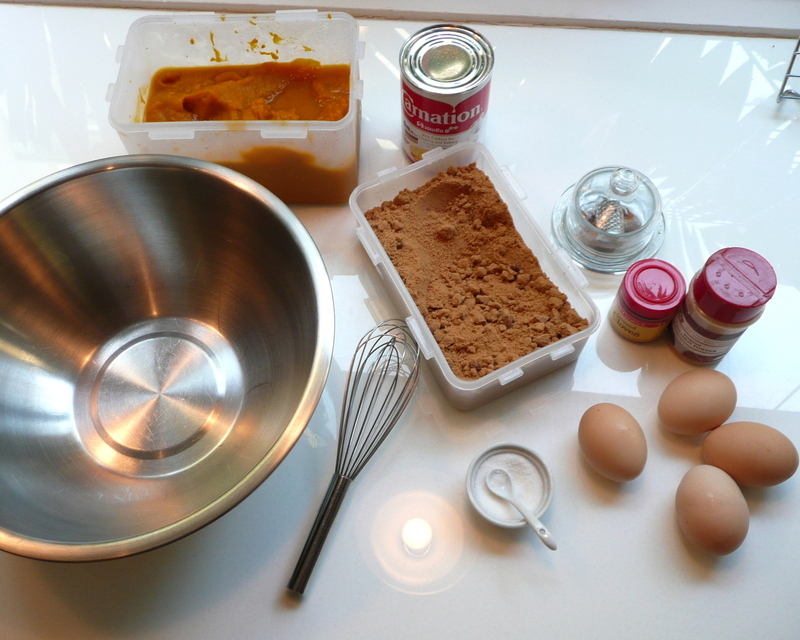 Roka challenged me to make a pumpkin pie from scratch. My first attempt was a few weeks ago. It turned out okay so I bought a whole mess of pumpkins and decided to make several pies and, while at it, a recipe of pumpkin biscotti. Tawn’s mother really likes biscotti and I haven’t made her any in a while. The pie worked out quite well. It isn’t that much extra work and the flavor is really lovely. 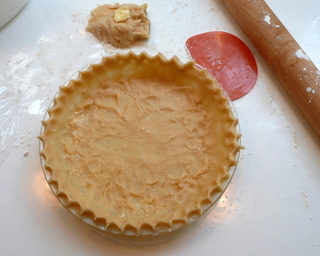 The pie crust is still an issue, though. What the heck is going on with it? I’m going to Cooks Illustrated to find out why I’m having so much trouble with it. It tasted fine but the texture was all wrong. After rolling it out, I couldn’t lift it up. It just disintegrated! Roka came over Monday night to try the pie. Since I had two (and we didn’t want to scarf them down by ourselves although we certainly would have considered doing just that) I invited other people over. Markus, his visiting mother and niece and nephew came over for what was, for them, a pre-dinner dessert. I also served them some biscotti and baguette washed down with tea. Roka really liked the pie. 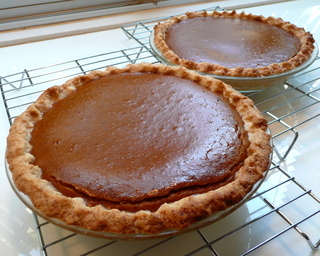 Markus and family did, too, but it is Roka’s opinion I’m most interested in because she was the one who first challenged me to make a pumpkin pie from scratch. 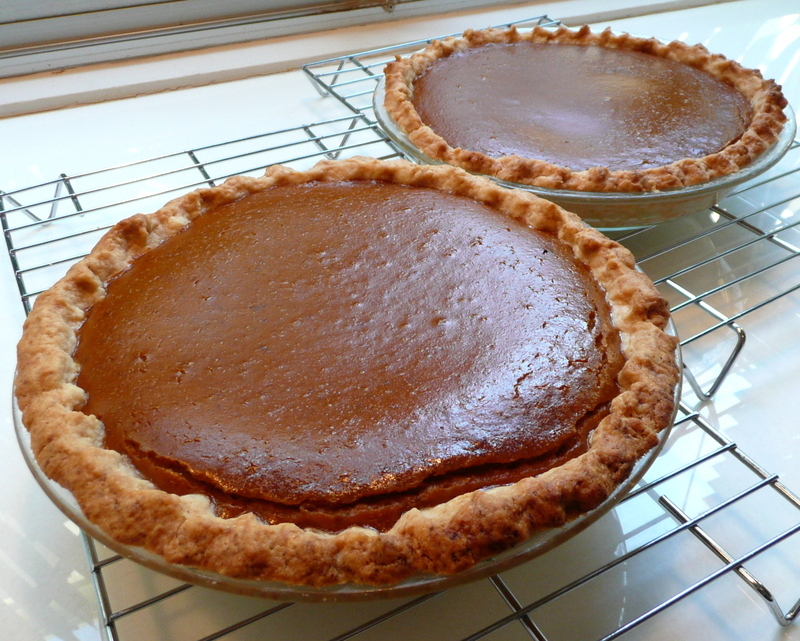 She was sad, though, because she thought that since I had made a successful pumpkin pie that I would move on to other things and she wouldn’t get another one. She drew this conclusion since she tried chocolate souffle for her first time two months ago, liked it, and I haven’t made it for her since! 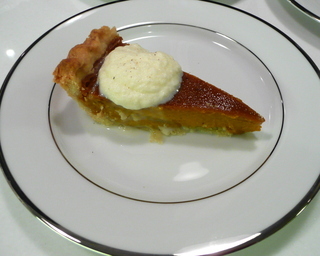 The whipped cream looks a little funny on that pie, doesn’t it? Markus picked up some whipping cream on his way over to try the pie and when I whipped it with my electric mixer, it never did really come together. Not sure why. Any theories or suggestions for me? 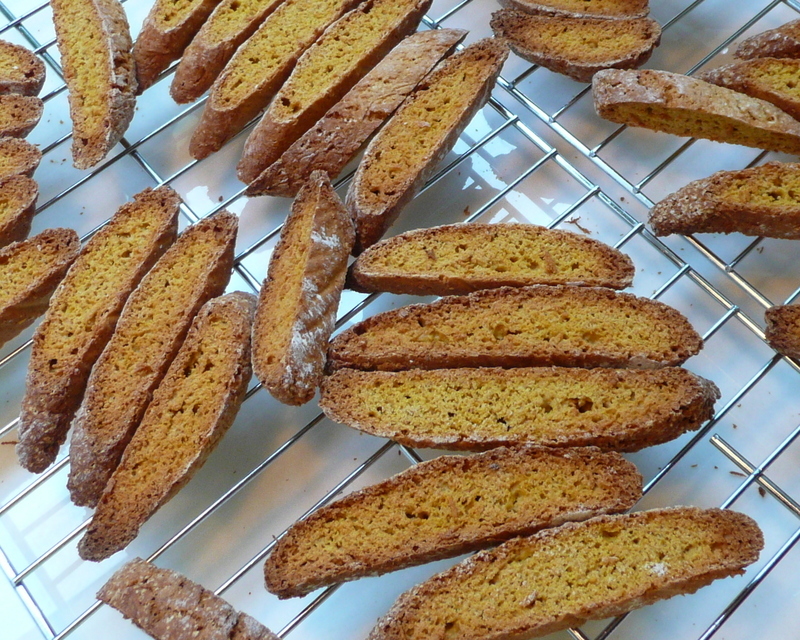 As for the biscotti, they turned out tasty but uninspiring. I think they need some pecans or cranberries or white chocolate chips – or maybe a little bit of all three? – to give them some additional umph. What’s next for the Iron Chef Thailand? Nah, just kidding… I’m a noncompetitive cook. My sister once suggested that we should have my cousin Patrick and I do an Iron Chef at a family reunion. I’d rather we just plan a big meal together and prepare it. This world is competitive enough without bringing it into the family kitchen. 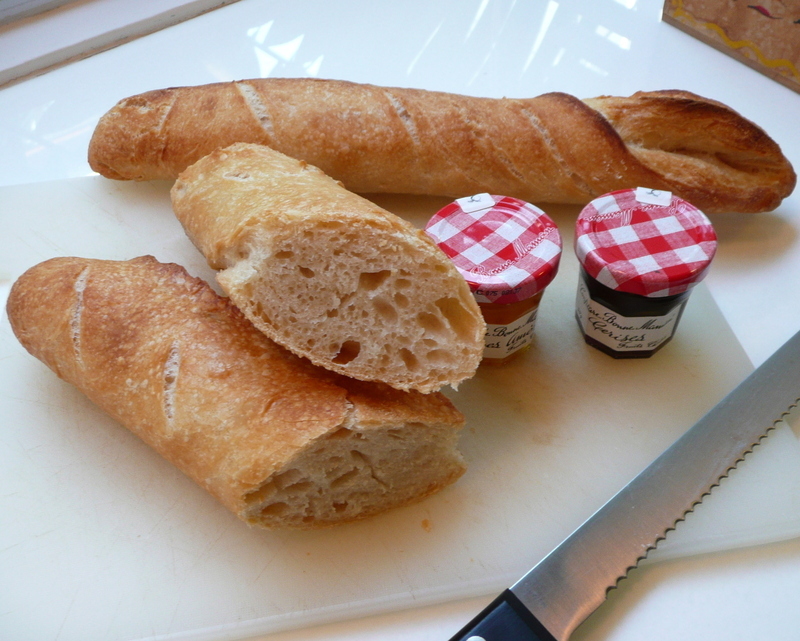 The first was a French baguette. I’ve dabbled a little in bread making but haven’t really taken the time to become good (read, “consistent”) at it. The San Francisco Chronicle did a series of articles on wood ovens last time I was there and I had a recipe for rustic bread from one of those articles that I wanted to try. Also, the latest issue of Living magazine had several bread recipes in it. 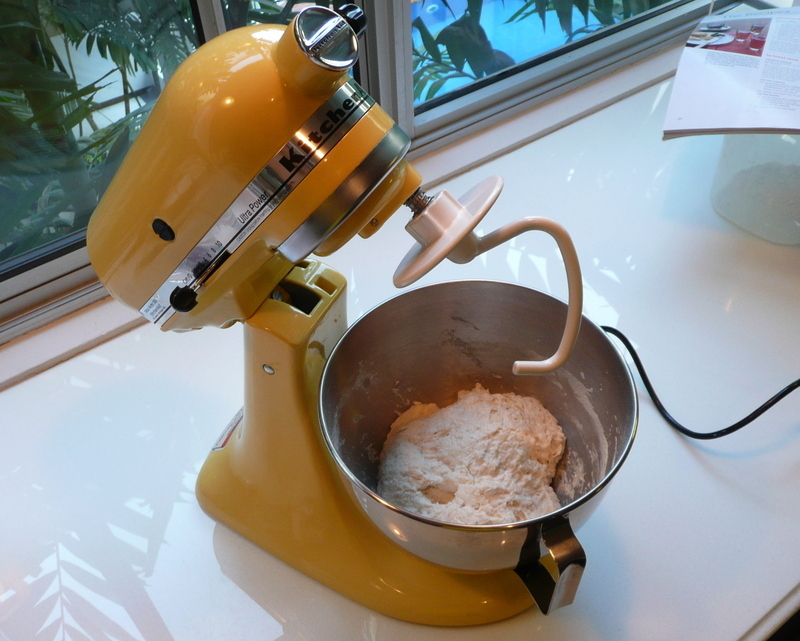 This prompted me to finally get our the Kitchen Aid mixer and bake. What I’m really looking for is to be able to consistently create a loaf with a good, crunchy crust and a tangy, spongy interior. 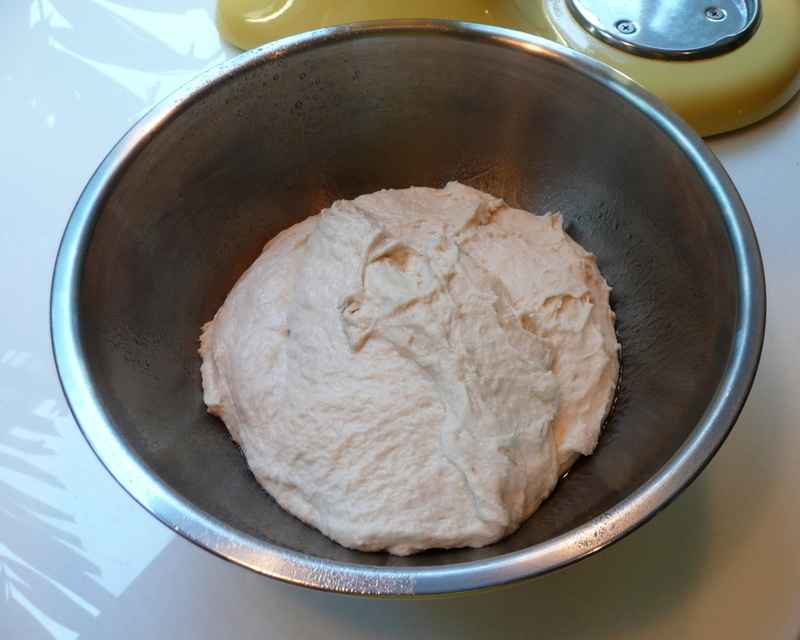 One of the key steps, short of making my own sourdough starter to hand down from generation to generation, is to create a small batch of starter that sits on the counter overnight. 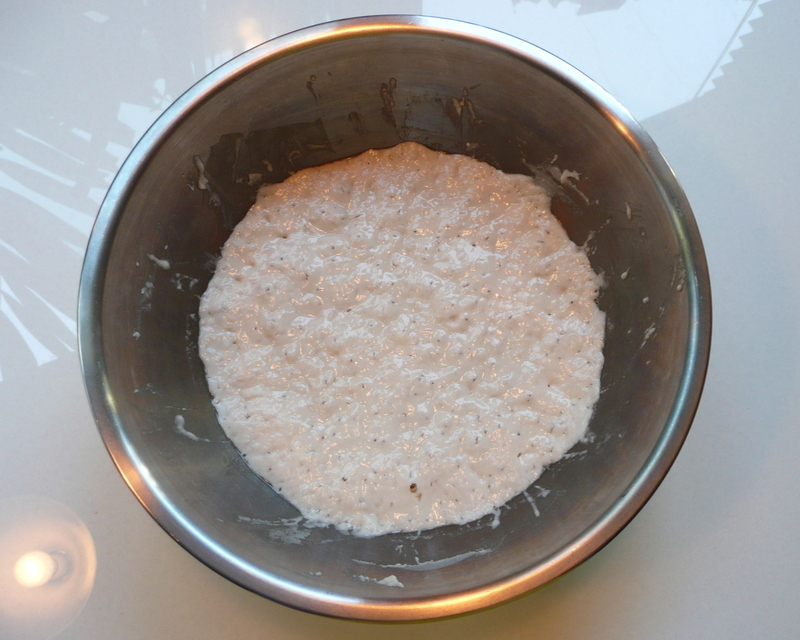 Starter is just flour, water, and a pinch of yeast. 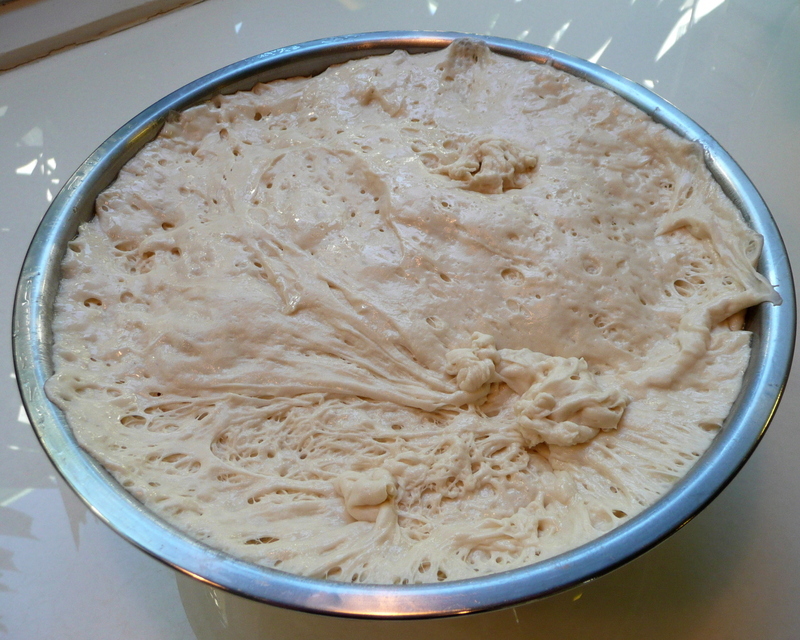 By giving it twelve or move hours to ferment, the dough is imparted with more flavor. 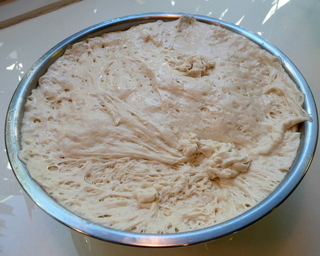 Top left: The starter about fourteen hours after starting. 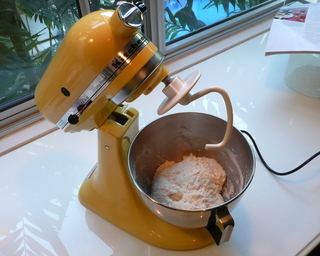 Top right: Kitchen Aid mixer is out, plugged into a converter (you should see it go when I forget the converter! ), and is ready to do the kneading. Lower left: After eight minutes of kneading, the gluten is starting to form and the dough has a smoother and more elastic appearance. 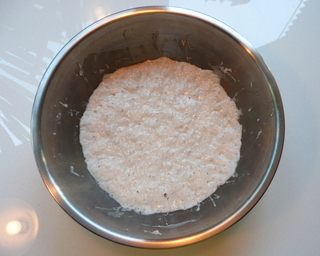 Lower right: After two hours of rising. Below: The finished product after being punched down, allowed to rise again in the refrigerator overnight, then shaped into logs and given one final rise before baking. The second and third items on the menu are pumpkin-related. One is finished and the other still has some work to do, so I’ll write more about those tomorrow. Meanwhile, let me leave you with this beautiful sunset from Friday evening, taken from the Thong Lor BTS station looking southwest through the construction site of the Noble Remix condo project on Sukhumvit 36. Buddha taught that life is a cycle of birth, aging, sickness, and death. Many of us are at a point in our lives where we are becoming aware of the aging of our parents. and I have reached that point. As we live further apart and don’t see each other as often, each visit makes the signs of aging a bit more noticeable. Many of us watch our parents help their own parents in their twilight years and wonder how easy or difficult that process will be when we (and our parents) have reached those respective ages. While my parents are both in their sixties, very active and in good health, and I’m in my early late thirties (to paraphrase Hedwig), I have reached a point where I’m becoming more aware of their aging and wondering for myself what that journey together will be like. Will I move back to the United States to care for them? What challenges and illnesses will they face? And how will we make that journey together in a caring and graveful manner? The thoughts that led to this post were prompted while I was listing to an interesting story on the subject from National Public Radio’s All Things Considered. Click here for the link to the story. Some of the other bloggers I read have written very eloquently on the subjects of aging parents and the loss of parents. I wonder what my reflections will be when that time comes? In the meantime, there is no reason to get so caught up in the future when there is a beautiful day starting. There are loaves of bread and biscotti to bake, errands to run, and a general contractor to plead with and bully. In short, it is a Saturday morning.